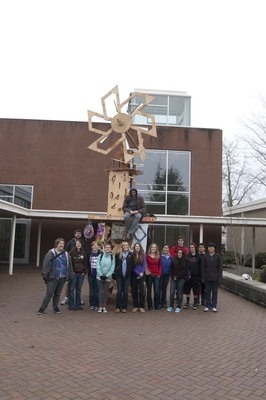 Hand in Hand is the collaborative sculpture built by the Introduction to Studio class at Linfield College during the 2011 January term. On April 21, 2011, the sculpture was burned to the ground in the field west of Miller Fine Arts. The Introduction to Studio class included students Will Bailey, Laura Breshock, Kyle Flynn, Amanda Holtby, Tori Kraft, Dung Le, Cody Levien, Jason Levin, Siwei Luo, Jacob Niebergall, Lauren Pak, Jenni Regan, Maddi Sams, Rochelle Santarris, Sarah Tellekson, and Mallory Turner. Holtby, Amanda, "Hand in Hand Collaborative Burn Sculpture 21" (2011). Introduction to Studio Collaborative Sculptures. Image. Submission 21.